Now for the blades. Veritas offers three choices: a 0.055″ thick blade that is meant to be bowed, a 0.125″ (1/8″) that is not bowed because of its thickness, and a 0.125″ (1/8″) thick toothed blade. I find that the 0.055″ blade, when sharpened with a 45̊ bevel and burnished at 15̊, as recommended, is too thin to fully avoid chatter on tough woods, even with a skewed stroke. I sharpen this blade at 90̊ and burnish at about 7-8̊, just like a card scraper. This avoids chatter and works well, but I would like the cutting action to be more aggressive. As for the 0.125″ blade, I feel it has the disadvantages of a thick, unbowed scraper blade: the tendencies to catch, dig in, and slice out of control. Here is what I now like best in the Veritas plane: Ron Hock’s 0.094″ (3/32″) blade. I think it’s just right! It can bend in the Veritas plane just enough to take a slight bow and is thick enough to eliminate chatter. Preparing the blade with a clean edge, 45̊ bevel, 15̊ (off horizontal) burnishing, setting the angle as described in the previous post, and adjusting for a light cut, produces a nice cutting action and a beautiful surface on wildly figured, dense woods – just the kind of wood that you need this tool for. The photo below shows the Veritas 0.055″ blade on top and the Hock 0.094″ blade underneath. I prefer to sharpen the blades with a straight, not cambered, edge because when the plane bows the blade, a sufficiently cambered blade projection is automatically produced. 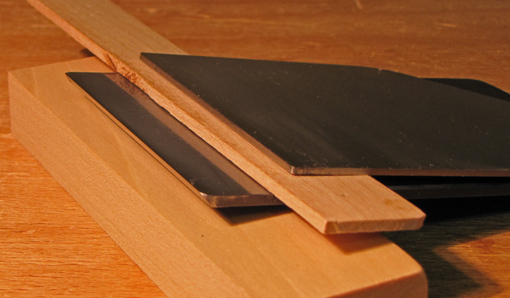 I’ve tried sharpening with a cambered edge and have found that it is more difficult to file and stone the edge. Furthermore, it is more difficult to initially set a cambered-edged blade into the plane with a centered, symmetrical projection because it can rock against the bench surface. A straight-edge blade produces no doubt. In summary, I love the Veritas large scraping plane with a Hock blade. Hopefully, I will be able to upgrade the rear handle soon, though for some reason the Veritas tote doesn’t bother me as much on the scraping plane as it does on their bevel-up bench planes. In the next post, I will describe an unconventional preparation for a second Hock blade in the arsenal which further expands the usefulness of this plane. This is great research into an important tool. Not one scraper plane has really proved satisfying, for me, to use, but I never have put the energy into finding out why. Your contribution here is really appreciated!